Bose SoundLink Revolve delivers true 360° sound for consistent, uniform coverage. Place it in the centre of the room and everyone gets the same experience. Or set it near a wall and sound will radiate and reflect around the room, immersing you. Taking it outdoors? Great, it's meant to go where you go. Make a connection. It’s easy. Voice prompts talk you through Bluetooth pairing. You can connect to two devices and the speaker remembers the eight most recently connected devices. Don’t have your phone handy? Don’t worry. Just press and hold the multifunction button to access the voice input for Siri and Google Now right from the speaker. 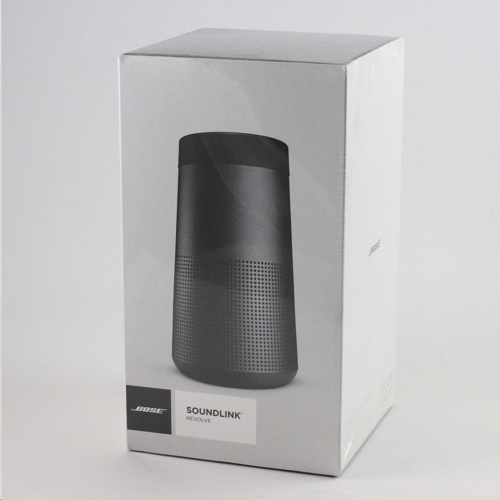 SoundLink Revolve’s water resistant design means that you can use it in more places without worrying. With extensive testing and an IPX4 rating, your speaker will long outlast an accidental showering of water.